How to Report an Online Scam? Do it Here. The online world is a mine field of scams. Have you stepped on one? If so, there a few things you can do to report & fix this as well as help others avoid it. How much you spent on it. Why you feel you’ve been scammed by it. 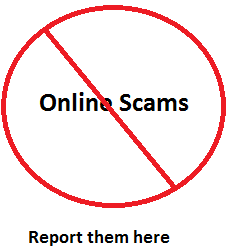 Note: Please keep these reports specifically related to online scams which promise to help you make money. 2. I will personally investigate this company and see if it deserves to be put in the “Avoid these places” area, a page dedicated to protecting consumers from being scammed by online marketing companies. If you used your CC to buy the product or service, immediately dispute it with your CC company. If need be, change the number of your card. A lot of online scams put you on re-occurring billing without your consent. To stop this, you either need to have your CC company put a stop on it, or change the number of the card altogether. If you provided any personal information, SS number and ANYTHING personal and fear some sort of identity theft or suspicious action to be taken against you, inform your bank about. Put them on alert just in case. Remember to post your experience/s with the company/s below. With your help, we can inform people on what to truly avoid and put these scam artists out of business for good. The purpose of this page is to help inform people as to which companies are legitimate and help you make honest money online and which are not. There is also a way to never be scammed again if you know the key things they try to use against you. Wealthy Affiliate University. Rated 9 out of 10 stars. Green light. Empower Network Env2. Rated 1 out of 10 stars. Red light. Neucopia. Rated 1 out of 10 stars. Red light. If you want me to personally take a look at a company you feel is a scam, let me know in the comments section below. I’ll get back to you within 24 hours and if need be email you as well with advice on what to do. Who knows the number to the 700 profit club? Looking for my refund, been waiting over 90 days to cancel it, 7/18. Hi Kennedy, I don’t know the number (I am not with this program), but this article may help if you can’t find it either. Keep in mind, trying to get something refunded after 90 days may be tough if not impossible to do, in the future, please make sure to get these things done earlier, maybe within 14 days in MOST cases. Yes, I would like to say I got scammed by 30 Minute Method. I paid my $37 upfront to them then after I got inside, they required another $184 to get started with another 5 web sites to promote Amazon products! I paid that then I got a phone call from Seattle, WA wanting me to upgrade even further. The price was $1500 to $3000 more! The next day Amazon told me they cancelled me out! I didn’t pay the $3000, but I’m trying to get my money back. That certainly sounds like a scam to me Douglas and I will be adding the 30 minute method to my personal list of reviews in the near future. What you went through however was a VERY common low price point entry, into a heavy, expensive upsells followed right after. This call you got from Seattle sounds like a typical scam company that tries to make solicitation calls in order to extract $1,000’s from people. Give your bank a call, and go through them, this company clearly doesn’t sound like they’ll make it easy for you to get the money back. And as for Amazon, you will need to start an Amazon site/account a different way in the future since it sounds like this particular place hooked you up with duplicate websites, which triggered the ban from the program. I was scammed by this same company Online Success Plan. They took $97.00 and then when I saw it was a scam I cancelled my credit card and I am going to report this and it happened to me today. Yeah I know about that program, I also dealt with it here, but you should be fine now that you cancelled your card Brenda. I am a 75yr old disabled woman who was scammed by Automatic Edge About 3 weeks ago. I unable to find a way to ask for my money back. So lf you can help me please do so. I can’t see well and am wheelchair bound. Hi Helen, I have experience with that program too, personally, they just gave me a number and I called them for it, but if you can’t find it, here is a special post I wrote for ALWAYS being able to get your money back from any online scam you run into. Tecademics – The Next Empower Network. Anything that is associated or compared to EN will immediately be looked at John, thank you for letting me know! I have been job hunting online for a couple months. Received an email through one of the sites that sends job leads. I am new at this, but I don’t think I am an idiot. First red flag. I did not receive a notification as I do with every lead. Don’t know how that happened. Then they asked me to set up an account on ‘HANG OUT’. We could continue on the regular email. The HR person was 20 minutes late for the online interview. His response to my questions made me think he was in a bad mood. The company’s web address link would not open (patthomeinc.com). He said they are still working on it. He evaded the question about what the company does or their products. During the interview, which only took about 15 minutes, he contacted his boss and told me I got the job. They will pay for my online training, $30 an hour. I could be a slow learner. They will send me a check to purchase materials from their preferred supplier. The BBB has never heard of them. That maybe a good thing. They also stated I will be the head of the physical office when they get it opened in my city. Now how do you know that? My gut feeling is this is a scam. I will play it until the final red flag. I won’t spend any money or deposit any checks. I want to see how far this will go before they will stop. Hi Carmen, there are definitely enough red flags for me to side with you. Is there even a name for this program other than the site you mentioned (which by the way also didn’t open for me)? It seems like they are OVER promising things to do you way before you even get started and this would definitely scare me away as well! I feel I have been scammed. The company is Cyber Digital Marketing aka: Cyber Digital Sales. When they called me to sell this, they said they were with Amazon, and I would be an Amazon Associate. I didn’t know much about it at the time, (foolish on my part). Their strategy of convincing me was incredible. I had just lost my job. 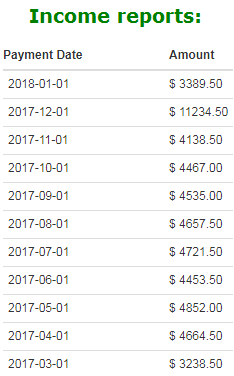 They told me I would be earning between $8000-$12,000 a month! I bought it!! They promised SEO, traffic, etc… I paid them $24,000 total in two different payments by check. They built the website, but I had them redo it within a couple months because it did not comply with Amazon. I paid them in February. I have earned $1.96! I could tell you more, but this would be too long. What do I do? Hi Stacy, I know of these kinds of companies (not this one specifically) that claim those things, but unfortunately after speaking with Amazon, they say these companies are not connected to them. What I do recommend is that you try to follow this refund option I have written about in regards to scams. Millionaire biz club. Is it scam or what? And what’s up with all these work from home programs? Are they just books teaching you how you could earn an income online? I thought it was what they say in the tutorials which is just sign up, set up your account and not sell nothing but make money. That program sounds like another binary trading bot (all scams). All work from home programs pretty much are either MLMs, PLR books, or in rare cases, good legitimate programs. Automatically consider any program a scam if whoever made it says you don’t have to do anything. These people promised me that I would make around $3,000.00 a month. I invested $9,500.00 with Alternative Online design out of Phoenix, AZ. That was on 5/15/15. Since then, I have only made $843.00! These people in their customer service department won’t even answer their phones nor respond 2 e-mails! They told me I would have a mentor & weekly training, never happened. I want my money back! I also invested $500.00 for a website with a company called accelerated web solutions and have only made $1.58 since Aug. when I joined up. These swindlers need to be put in jail! I do not know how they sleep at night! I’ll look into both programs Carol. The fact that you made over $800 with one is actually a good sign, but tells me that either you didn’t do enough with the program or they weren’t giving you enough to work with. However, when you say you called and emailed them and didn’t get a response, that’s a very bad sign. I originally saw an ad online and as many, which lead to a video and I became intrigued and decided hey why not. I signed up for a conference call to go over what this “SO CALLED” system was. I should have placed a red flag when they did not call at the designated time, in fact they were 30 minutes late. So I decided to hear them out when they called and this so called Underground Online Specialist had a really good pitch that he had me. Thing is, he never even discussed a product but more on the coaching side which I disregarded because his pitch was so good. It was my mistake for not doing my research prior to it, if not I would have noticed all the red flags that I will inform you of. The pitch then led to the price which was astronomical: $6,000 for coaching??? Seriously, I was like this guy is full of crap then he started to do a breakdown of the price and kept coming down and if I took action now I would lock in a specific price of only $3000. I was like, well that’s now half price but I needed to think about it. Since I was looking for a system for LEAD GENERATION, I decided hey, if I put a down payment of $500 I could always get that back if it didn’t seem legit. So, I gave him my card and they processed the payment, but what was strange is that I never received an invoice, never signed for anything, NADA! So something felt fishy, we were supposed to have a phone call the following day to go over a few more things and for him to get the other payment to move forward but prior to doing so I decided to do some research and what was strange is that I could barely find anything on this guy. He claims to be a underground online guru yet has little to show for it? His website doesn’t give any info on any product or his coaching just some videos of other so called clients that are selling his coaching. So I started digging some more and came around to some videos of him being part of MOBE. I had never heard of this so I did some more digging and read that this MOBE/ MTTB is some sort of MLM/Pyramid Scheme. As I read more into it, it looked very similar in price range and style that Mr. E.K. David had been promoting. So, I decided to continue searching for more information and noticed that his so called students also promoted the MOBE lifestyle, pitches and similar websites. I confronted Mr. David and he said it was not the same stuff, yet, could never prove to me what his system was or what was he selling. The more I did research on this guy, the more or little I could find. He and his members all claim that they have been seen on FOX NEWS, ABC, Etc. and when you do a search for this, you wont find anything as well so, how could this so called underground marketing guru have little online about him, or his system or success but a few videos? Yet, all of the info. that you do find is related to MOBE/ MTTB. So I have decided to not move forward with his services as all arrows point to an MLM scam even though he says no but when something seems to good to be true, it typically is. The $500 deposit, well, I will be calling my bank and disputing this because it was a SCAM! I came across your site while doing the research for this and read that you as well disagree with the MOBE business structure, so I wanted to share my experience as well, if you could check into this and let me know if you as well find it to be a SCAM that has been spawned from the MOBE/ MTTB MLM lifestyle. Hi Melissa, that’s a crazy story, but I am not surprised. I hear this kind of stuff more often than you think. In regards to David, I can’t comment on whether or not he’s connected to MOBE/MTTB. I will have a look at the site you mentioned and do some research on my own. But for MOBE/MTTB specifically, yes, I think it’s a pyramid scheme (and that’s not all). It is also possible the call or the ad you saw might not have been related to either that person or the MOBE company, but just basic coaching scammers sell or possibly another MLM program. Based on the prices you talked about I assume it’s one or the other, the question is who is it connected to. I wish you would have give me the website where you first saw that ad. I’d be able to figure it out then, but that’s ok. I am glad to see you’re taking action to get your money back and I hope that you do! I was scammed by Jason white surveys. I have sent 4 e-mails and they have answered none. That’s $37.00 I’m out. Great support package. Thanks for reporting this one Bev. Looks like I already tried it too. Is this it? Kelly Scott is probably all I have to say! Calling to try to get a refund tomorrow. $77 on my c.c. Yep! I’ve already done reviews on “her” programs. Hope you get that refund Katie! Pat, you need to let your bank know about these things. You have better chances of getting refunds that way. It’s alright Jennifer! I have been taken a few times as well. Thank you for reporting this. I’ve found a lot of programs under this name (it’s possibly a fake) and have warned them about it. Received an e-mail regarding this work at home company. Went and purchased the basic and VIP package at $97 dollars each. Had a 60 day money back guarantee plus was endorsed by various networks, so I thought it was legitimate. Took me to their member login page and won’t let me do anything. Tried to contact the support e-mail and it aborted sending within seconds. Called my credit union to see if it could be denied since charges are still pending. Not able to do that. The provided me with a phone number. Just a recording in Spanish that keeps repeating the same thing. Tried looking online for a phone number to no avail. Hi Frank, I saw you added that the program is Extreme Home Profits. I recognized everything in your comment because I went through the exact same thing, including the phone number and it being a message that doesn’t lead anywhere! Thank you for mentioning this program and luckily, I’ve already reviewed it. By the way, check to see if they provided you with a support email. If they did, email them about a refund. I don’t remember if it was for Extreme Home Profits or another company, but I got my money back within 2 days. I have been scammed by Project Payday and The Power Team (Ouch, that was a big loss of money for me). This is just to name a couple, as I have experience hundreds in my search for an honest to goodness work at home opportunity. Well, I won’t be paying anymore, thankfully, because of your website, plus the fact that I am broke. One thing I do have to offer is determination to work hard and succeed! Hi Dale, we share a lot of similar experiences in the been scammed department! But it doesn’t mean it’s all a waste of time. I see it as an adjustment to the right path. That’s how I found Wealthy Affiliate and I know that’s where you’ll find it too. so like a fool I paid it, then they offered a 30 minute session with a live professional to start you up at 9.95 I payed it just to find out I had only a 48 hour window to contact the company or I lose out on the 9.95. So I called the number right away and low and behold I had to leave a massage RIGHT! After all of that they offered me a free full website so sure I was going to shoot for it, but once I clicked for the free sight, of course there is a charge! of 249.00 I tried to bi pass it and I couldn’t continue without setting up the sight. So I knew for sure it was a scam, I contacted customer service for a refund and I was told that they could only refund me 1/2 of my total due to the change on their return policy made last month which I would have to go to their new website to retrieve it. Well that was it I had it with them, I put my paralegal knowledge into play, was put on hold for about three minutes and when she came back to the phone her senses came back as well. I received a full refund but it was only and I mean only due to the fact that I knew the law. PLEASE BE AWARE IF YOU SEE ONLINE RICHES UNIVERSITY RUN THE OTHER WAY! That’s a horrible experience Tameka! I did a review on online riches university not too long ago and I knew their scam ran deep, but you really explained it thoroughly. Thank you for sharing this and warning others about it. I’m glad you were able to fully refund your purchase. Folks if you ever run into these situations, never settle for a % of what you paid. If you got scammed, demand a full refund and don’t accept anything less! Thank you so much for this website. We need more websites like this to keep us from being scammed. And also to keep us on the right road to making money online. Thanks for your comment Pauric. If there’s any scams to report, post them here. All the best!